Comments : I wanted to let everyone know about the Riley Ward Woodham facebook page and invite you to send us a friend request; this facebook page was also created to connect family members, so spread the word! Obviously, we could not get all of the names into the page title so we took our lead from Bob White who organized the 2010 family reunion in Echo, Alabama. Bob retired as this family reunion organizer and my daughter, Tamra DeMaria (Great Granddaughter of Willie Mae Riley) and I, Dianne Voght (Granddaughter of Willie Mae Riley) are working with Bob while we transition into organizing the next family reunion. We are waiting to hear about the status of the family genealogy book which is being published by Manonia Snell. She was at the 2010 family reunion in Echo and shared some of the history, gathered a lot more information and took some pre-orders for the book. You can email us at rileywardwoodham@gmail.com with any ideas for the upcoming reunion. 2/4/2011- My name is Penny Rone Nichols. I am a descendant of Daniel Riley. I found your site from the everton's world vital records. I would like to contribute information you may not have. I have a website on myheritage.com (Rone site). I have a picture of Mary E Rogers Riley and her husband William Riley, given to me by my grandmother. Her husband's grandfather was William R Riley. I would be happy to send it and and could see if you have it already. I am having trouble accessing pictures. It may be that is because I have a Mac. I would love to see some of the ones you have posted with links. I don't have a picture of Daniel Riley but would like it. 01/10/2011- I am the great grand daughter of James Irving and Lena Riley. My grandmother was Vallie Lee Riley Steele and my mother was Juanita Riley Hagan Du Fresne. My mom, born July 24, 1936, passed away on July 4, 2001. She passed away from complications of lung cancer. I have found your site to be so very interesting. I would like to know if anyone has any information on my mothers father. When I was making the funeral arrangements before my mom passed away, I had to find out who her father was, since he was never discussed or mentioned. The name that was obtained was Cletus Sketo (spelling may be incorrect). I know he was from Alabama and thought he was from Opp, where my mom was born, but I can not locate any information to the verify that. I was also told that his family owned a grocery/gas station. Any assistance with information will be greatly appreciated. 10/23/2010- I have been trying to track down the early census records for John Riley Sr and Generation 1. The 1820 Gale McCoyand 1830 census for Darlington, South Carolina list a Whittaker Riley, also spelled Whitacre Riley living in close proximity to Edward Riley. He is in the census age range up to 10 years older than Edward. There is no mention of him as a member of the family. However, since Whittaker was Mary Polly's maiden name, I cannot help but be curious about a possible relationship or connection. Does anyone know who Whittaker Riley could be? 08/06/2010- I came across information on the Old Center Cemetery in Newville on your website. I have a question about several graves that are in a Riley plot. Joseph A Riley married Jane Johnson. In photos of the plot, I see at least 4 additional headstones. One of the headstonesbelongs to Jane's mother Elexy M Johnson and another belongs to Sarah Ann Johnson, Jane's aunt. I am trying to find information on the Johnson family, so I am wondering who the other two headstones in the plot belong to. Can you help with this? 02/16/2009- I recently stumbled across two posts (of undetermined date) on your website that mentioned the possibility that E. William Riley (b. abt. 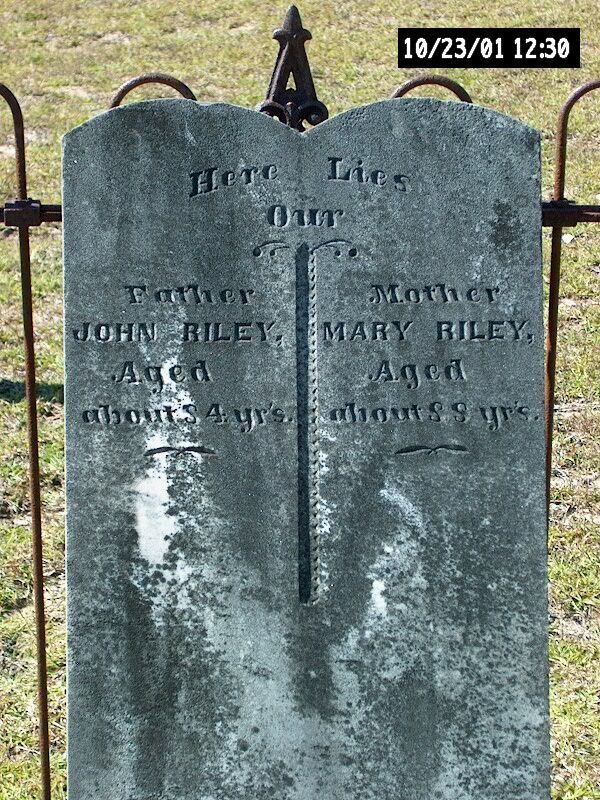 1812 in S.C.) might be a son of John Riley, Sr. The story I’m most familiar with says E. William was born in S. Carolina (based upon the 1850 Calhoun County census) and married Elizabeth Majors Land, born in Georgia, around 1840. William Lawrence, my Great-great-grandfather, was his son. William Lawrence served in the 53rd Alabama Partisan Rangers. He enlisted in Dale County, Alabama in 1862 under Captain W.T. McCall. His arm was amputated after being wounded at the Battle of Waynesboro, Georgia. Based upon DNA inference, E. William’s Paternal Haplogroup is R1b1b2a1b5b, which places us in northwest Ireland in the not-so-distant past. However, it is quite a jump from County Cavan to South Carolina! If you know a male in direct line from John Riley, Sr. who has completed Y-DNA testing, we could confirm or rule out the connection. My DNA can be found on Y-search (www.ysearch.org) as JNCWC. I am also on Ancestry.com. My tree is listed under tree name GREMAX. I would enjoy learning more. 01/11/2009- I was looking at the “Descendants of John Riley Senior” web site this evening and noticed what I believe to be a typographical error with Herbert Riley and Claudie B. Riley data. vii. HERBERT RILEY, b. May 1898, Dale County Alabama; d. Aft. 1950; m. EFFIE; b. 1900. My grandmother’s (Claudia B. Riley Speigner’s) bible indicates that Herbert Riley’s name was James Herbert Riley, b. 23 Sep 1899 and that he married Vannie "Nanny" Wright on 17 Dec 1916. No place of marriage or birth date was given for Vannie Wright. However, I remember family saying that granny and uncle Herbert got married at the same time. viii. CLAUDIE B. RILEY, b. 17 Dec 1900, Dale County Alabama; d. Jul 1983, Wetumpka, Elmore County Alabama; m. (1) Fox Henderson (Spigner) SPEIGNER; b. 1896, on 17 Dec. 1916 in Georgia across river from Eufaula, AL; m. (2) CONNIE WRIGHT, 1916, Dale County Alabama; b. 1895. Claudia B. Riley married Fox Henderson (Spigner) Speigner on 17 Dec 1916 in Georgia, across the river from Eufaula, AL. They lived in Dale County until sometime after 1930. The 1930 census shows them living with their children, Mabel, J. D., and Roy on Riley Road, Beat 9 (Echo), Dale County. Sometime between 1930 and 1940, Claudia and Fox were divorced and Fox married Vinnie Jurkin. Claudia never re-married. When Fox and Claudia were married, Fox’s last name was spelled Spigner. Sometime in the mid to late 1920s, the family of Spigners in south Alabama discovered that the original spelling of the name was Speigner (from the original John George Speigner who came to America in 1753) and decided to change the spelling back to Speigner. John George had received a grant of 400 acres from King George in 1754, and some of the family had remained loyal to the King during the Revolutionary War. A number of the family (grandchildren of John George at the time of the war) changed the spelling to Spigner and some to Spigener. Most likely to avoid being confused with the Loyalist Speigners, and also to not sound so Germanic as the Hessian troops were committing a lot of atrocities in South Carolina. When land opened up in Alabama, a number of Spigners, Spigeners and Speigners made their way west to homestead. My great-great-grandfather, Jesse Spigner, moved to south Alabama sometime between 1835 and 1840 with his mother, Mary Ann; stepfather, Amos DuBose; sister Mary Ann and her husband John Wells. The first records I have found of them in Alabama is the 1840 Census which shows Amos Dubose and John Wells both living in Dale County, AL. I was looking at the web site trying to assist someone with a question regarding a Mary Riley marrying a Stuckey. Is there anything in your data to connect these two names. 01/06/2010- I have a question regarding Whitaker Riley, who marred Naomi Bess and lived in Henry County. Did we conclude that Whitaker Riley (b. abt. 1797) was truly John and Mary Whitaker Riley's son? 05/22/2009- Does anyone know if John Riley, Sr, (married to Mary Whitaker), was in the Rev. War? If so, do you have any information on his records? It would seem that he would have served because of his age.